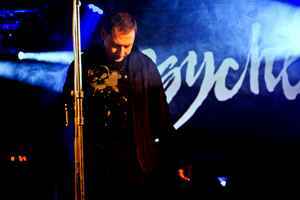 Psyche started in early 1982 as brothers Darrin and Stephen Huss performed for the first time in Edmonton, Alberta, Canada under the name PSYCHE. Briefly appearing as a trio with Dwayne Goettel on synths. They performed a combination of horror and electronics that was completely unheard of in their region. After several cassette releases their debut album "Insomnia Theatre" was released through their own label independently in 1985, and later signed to New Rose Records for a new edition making it's European debut. Ever since the underground success with "The Brain Collapses", and club hit "Unveiling The Secret", Psyche has continued to release a variety of songs and albums enveloping every facet of the electronic pop music genre. From cold harsh industrial, through warm synthpop, dancefloor minimal, dark wave, and beyond. Various members have collaborated with Darrin and continued expanding the Psyche legacy from the renowned cover of "Goodbye Horses", to "Sanctuary", and what can be heard on "The 11th Hour" as well as seen on their Imaginary Life DVD which compiles music videos, and performances covering the years between 1983 - 2005 respectively.